MRVC Recruitment 2019: Mumbai Railway Vikas Corporation Ltd / www.mrvc.indianrailways.gov.in is conducting recruitment processes to fill 1 vacancy. As of now, there is one recruitment drive going on for Dy. CPM (Civil) Post. MRVC Recruitment 2019 - Job notification for Dy. CPM (Civil) Post in MRVC, Mumbai, Maharashtra on Deputation Basis. Applications are invited by Mumbai Railway Vikas Corporation Ltd on or before 30 days from the date of issue for 1 vacancy. MRVC Recruitment 2019 - Job notification for Chief Project Manager (Civil) Post in MRVC, Mumbai, Maharashtra on Deputation Basis. 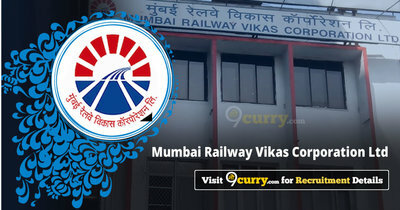 Applications are invited by Mumbai Railway Vikas Corporation Ltd on or before 23 Mar 2019 for 1 vacancy. MRVC Recruitment 2019 - Job notification for SLCO Post in MRVC, Mumbai, Maharashtra on Deputation Basis. Applications are invited by Mumbai Railway Vikas Corporation Ltd on or before 16 Feb 2019 for 1 vacancy. MRVC Recruitment 2019 - Job notification for FA & CAO Post in MRVC, Mumbai, Maharashtra on Deputation Basis. Applications are invited by Mumbai Railway Vikas Corporation Ltd on or before 15 Feb 2019 for 1 vacancy. MRVC Recruitment 2018 - Job notification for Executive Engineer Post in Civil Engineering Department, MRVC, Mumbai, Maharashtra on Deputation Basis. Applications are invited by Mumbai Railway Vikas Corporation Ltd on or before 27 Dec 2018 for 1 vacancy. MRVC Recruitment 2018 - Job notification for Dy. CPM Post in MRVC, Mumbai, Maharashtra on Deputation Basis. Applications are invited by Mumbai Railway Vikas Corporation Ltd on or before 26 Sep 2018 for 2 vacancies. MRVC Recruitment 2018 - Job notification for Dy. Chief Electrical Engineer Post in MRVC, Mumbai, Maharashtra on Deputation Basis. Applications are invited by Mumbai Railway Vikas Corporation Ltd on or before 05 Sep 2018 for 1 vacancy. MRVC Recruitment 2018 - Apply Online for Director (Finance) Post in MRVC, Mumbai, Maharashtra on Absorption. Online Applications are invited by Mumbai Railway Vikas Corporation Ltd from 05 Jun 2018 to 03 Aug 2018 03:00 PM for 1 vacancy. MRVC Recruitment 2018 - Job notification for Chief Operations Manager (COM) Post in MRVC, Mumbai, Maharashtra on Deputation Basis. Applications are invited by Mumbai Railway Vikas Corporation Ltd on or before 21 Jun 2018 for 1 vacancy. MRVC Recruitment 2018 - Apply Online for 34 Project Engineer Posts in MRVC, Maharashtra. Online Applications are invited by Mumbai Railway Vikas Corporation Ltd from 24 Apr 2018 to 10 May 2018 (Extended till 20 May 2018) (Further Extended till 30 May 2018) for 34 vacancies.